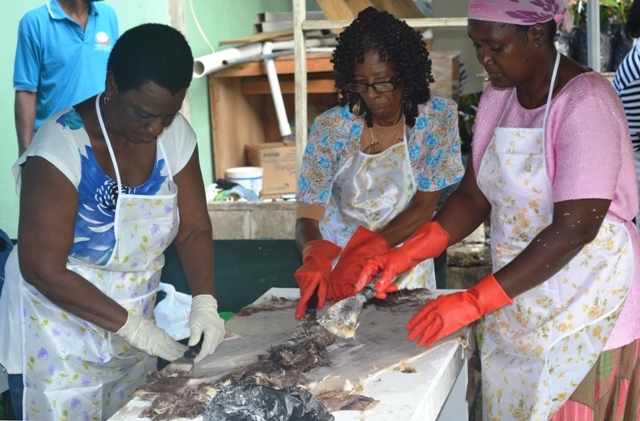 NIA CHARLESTOWN NEVIS (MARCH 07 2016) — The Small Enterprise Development Unit (SEDU) in the Ministry of Finance on Nevis, launched a workshop for persons interested in learning the tradition of animal skin tanning. The two-week program which commenced on March 04, 2016, on the grounds of the Department of Agriculture at Prospect, serves to revitalize one of the island’s dying traditions in which the skins are utilized in other areas. Director of SEDU Mrs. Catherine Forbes said the training workshop was developed because of a concern of Premier of Nevis and Minister of Finance Hon. Vance Amory, that the art of tanning was dying and needed to be revitalized. “He instructed we do something from the skins gathered from the Abattoir. His concern is that the older persons who have been doing it are no longer alive,” she said. Forbes added that the bi-products created during the training workshop will be displayed at the Department of Agriculture’s annual Agriculture Open Day Fair scheduled for March 17-18, 2016. Workshop Facilitator Christobel Jeffers, said after the skins are chemically processed, bi- products including the drum coverings, jewelry, keyrings, pendants and other souvenir items will be produced from the leather. Also present at the start of the workshop were Premier of Nevis and Minister of Finance Hon. Vance Amory and Permanent Secretary in the Ministry of Finance Colin Dore.